A dominating performance from a few places before the money bubble all the way through the final hand of the event, @AriEngelPoker takes down the Season XIII @HPTPoker Championship at @AmeristarSC - and with it the Player of the Year title as well. Engel came to the Championship 19th in the Player of the Year standings, only able to win the title with a tournament victory and the players in the top 10 not making the final table. 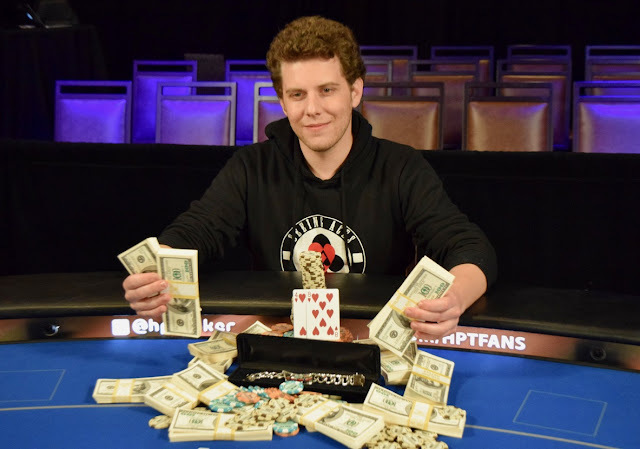 He hit every benchmark along the way, taking the chiplead right before the money bubble, bursting the bubble and rolling all the way to the final table. The final table was rough-going for a while, down to 10BB at one point, but he recovered, eventually defeating Jake Bazeley heads-up FTW. Engel earns $162,154 for first place, and entries in to six HPT Main Events in Season XIV as Player of the Year.